Transportation buildings, such as bus stations, airports and parking garages, are transitional spaces - people stay there only a few minutes or hours. They tend to be regarded as mono-functional areas in urban and rural areas and often have an uncomfortable atmosphere. Some of the impressive architectural projects in the recent past, however, show that functionality and aesthetics can interact very well. The newly constructed buildings end up with a different image: They act as comfortable places to stay and as prestigious entrance gates to regions and cities. The town of Nördlingen in Swabia has had a new bus station with adjacent parking garage since 2010. 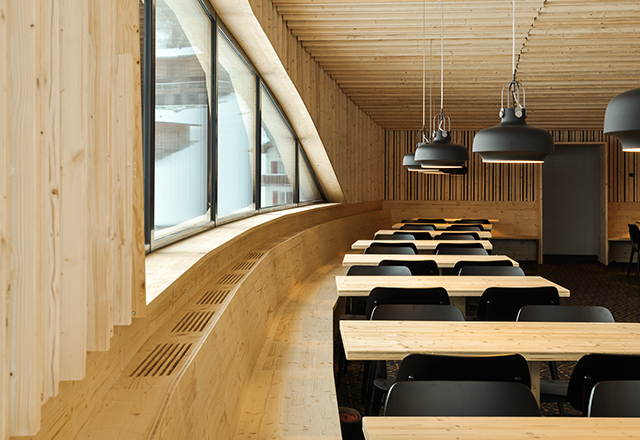 The architectural firm of morpho-LOGIC from Munich was awarded the BDA Prize for Bavaria in 2013 for this impressive construction which gleams in golden light. The covered bus station with 10 stops as well as the parking garage with its 150 parking spaces are located parallel to the train tracks. Even though the sections of work were tendered separately, the individual elements form a unit. Thus, the striking facade of the parking garage is made of gold-colored expanded metal elements. 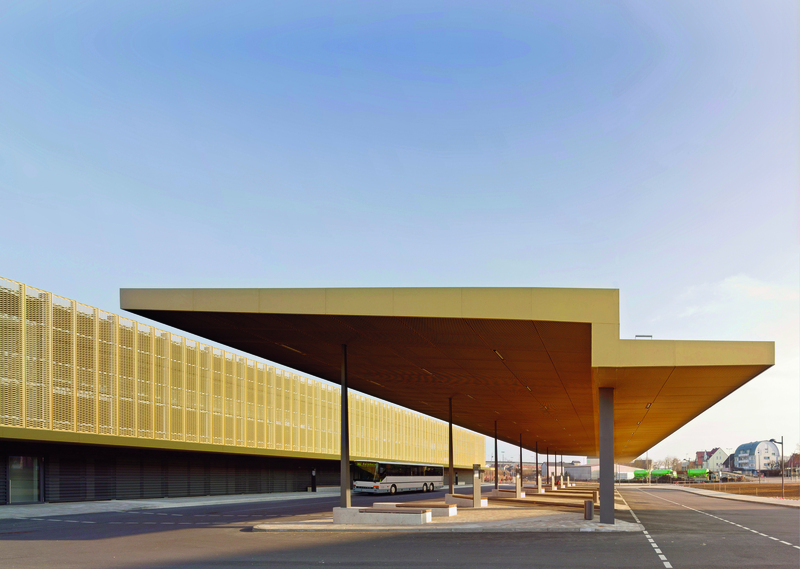 The 18 x 56 meter roof of the bus station takes up the proportions and materials of the opposite building and also shines in gold. The kink in the roof window symbolizes the separation between the waiting and transit area, whereby the conically-shaped columns in the first part make the roof seem like a tray on finger tips. 1. The airport needs to handle the projected higher number of passengers. After its completion, Terminal 1 alone will have capacity for up to 12 million passengers annually. 2. The flow of passengers should be more efficient and intuitive. 3. Costs are to be reduced by amalgamating areas, such as the baggage check-in. 4. Numerous shopping possibilities should increase the attractiveness of the building as well. The "little pearl of ski areas", Pradaschier, close to the Bündner main city of Chur, is a popular holiday destination, especially in wintertime. 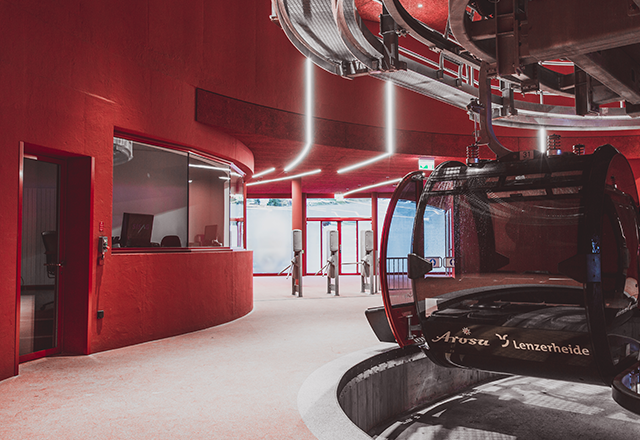 The town of Churwalden, which is situated at the foot of this area, wanted to not just build a new lift station but a multi-functional building: A building that vacationers and locals alike can use in summer and winter. 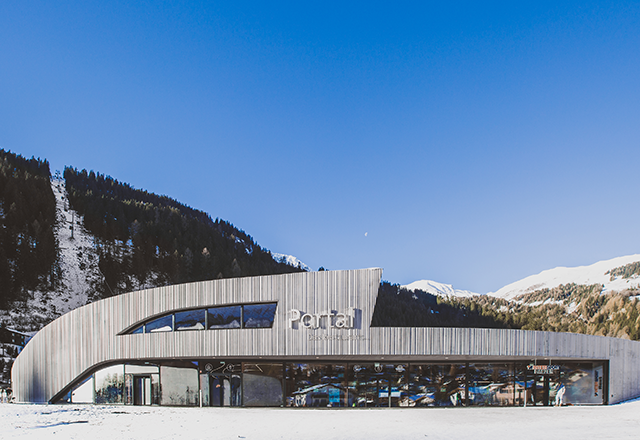 Now the lift station combines a sports facility, a restaurant and a viewing platform. The sickle-shaped concrete building nestles on the hillside and separates the town center from the camping site beyond it. 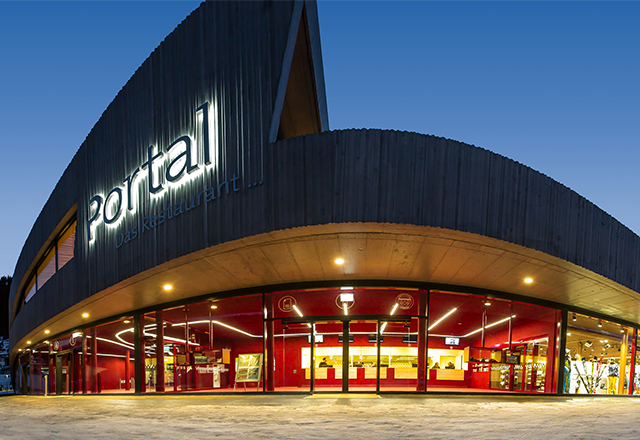 The cool and subtle architecture of the exterior contrasts with the colorful design inside: Bright red walls and snake-shaped LEDs guide the visitors of the "portal" to the ticket offices and to the restaurant. Local architects Ritter Schumacher were in charge of this project. In 2016, they received the "Award for Marketing + Architecture” for this new building, an award for high-quality corporate architecture. Whether a bus station, airport or lift station - these examples prove that traffic structures can do more than simply be functional. The airport construction in Marseille has impressive aesthetics as well combines passenger handling, a shopping mall and a place for relaxing. The same applies to the lift station in Churwalden and the bus station in Nördlingen - they are gateways to another world. People in Stockholm also discovered how beautiful transportation structures can be: The impressive subway station architecture becomes an art experience here.